Another Monday, another Forlorn weekly column! He’s decided he also fancies starting a multi-post series and this time round, we dip into the dark and dangerous world of market speculation. There are various guides to playing the markets Eve Online. But what about expansion speculation? In this, first of three posts, I will take a look at a long-term market investment within Eve Online’s development frame. The second post will cover short-term speculation while the last post demonstrates a more traditional approach, considering competition not just with other marketeers but also industrialists. In early 2012, a devblog was released by CCP Ytterbium on ship rebalancing as well as skill requirements. It hinted at a full rebalance of my favourite class: command ships. Since trading in ships requires large ISK investment with a low margin (you are competing with builders and, in theory, an unlimited supply), I looked for a niche that would benefit from rebalanced command ships. I made a list of different items and mods that are only used on those hulls. My focus went almost immediately to warfare mindlinks. Those implants were only available in storyline missions so supply was limited. When CCP changed how agents worked in Incarna, the number of mindlinks available on the market went down even further as only a third of the previous storyline missions were available. 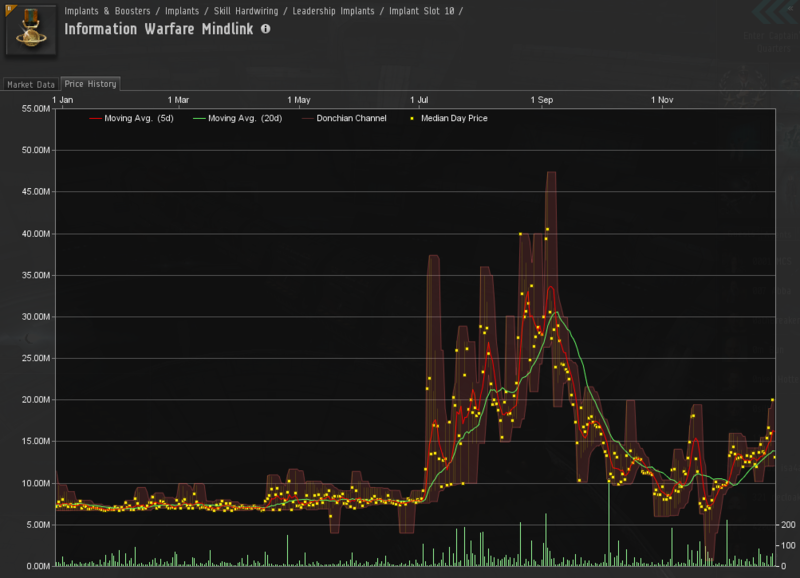 Common prices for skirmish mindlinks were around 200 mil ISK and approximately 120 mil per unit for both armor and siege mindlinks. The underused information mindlink was being traded for only 6.5 mil per unit – there was my speculation target. But of course, this was not the only project I did for Odyssey… More on that in my next post!